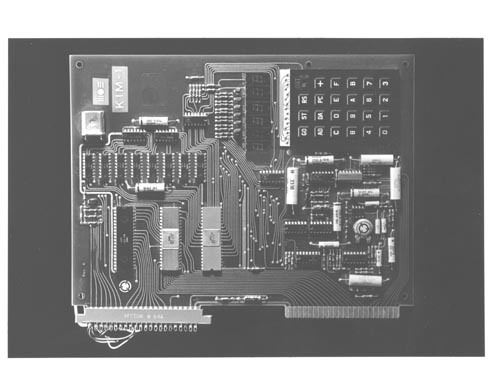 B&W image of KIM-1 motherboard. Metadata on paper label Verso: " The KIM-1 (1975). The KIM-1 is a single board personal computer based on the MCS 6502 microproscessor by MOS Technology. This microprocessor is the same one used by Apple II and many other popular personal computers. Measuring approximat3ely 12' x 8' x 3', it was a low performance, low cost personal computer that was sold for $2456 when it was released in 1975. Intended for use by radio and computer enthusiasts, the KIM-1 had 1K byte of RAM (random access memory) and a 2k byte monitor in ROM (read only memory). It featured a keypad, LED readout, cassette and serial interface which allowed it to be plugged into and interface with printers, terminals, tape recorders, and video devices. The KIM-1 is on display at the Computer Museum in Boston and is an entry in the museum's Early Model Personal Computer Contest, May 13, 1986.